Five hours before a Sri Lankan-inspired dinner of pol roti and curries I promised to cook for my friends I walked into an Indian grocery store to buy ingredients for the said dinner. Me (in the best traditions of Bollywood movies, almost falling to my knees and screaming at the skies): Noooooooooooooooooooo! Shop assistant (clearly scared by crazy Russian lady): Ok-ok, madam, let me check in the back! Shop assistant (returning with a pack of coconut! ): Here you are, madam! Me (pleasantly surprised by how effective dramatic screaming can be and therefore overly confident): I need two of those. Shop assistant goes away and comes back with one more pack of frozen coconut! Hell yea! Traditional Sri Lankan breakfast. From top right corner clockwise: hoppers (local pancakes), egg hopper (same pancake with egg in center), pol roti, coconut sambol (grated coconut mixed with chili), chicken curry, lentil curry. In the center: lunu miris (onion and chili paste). 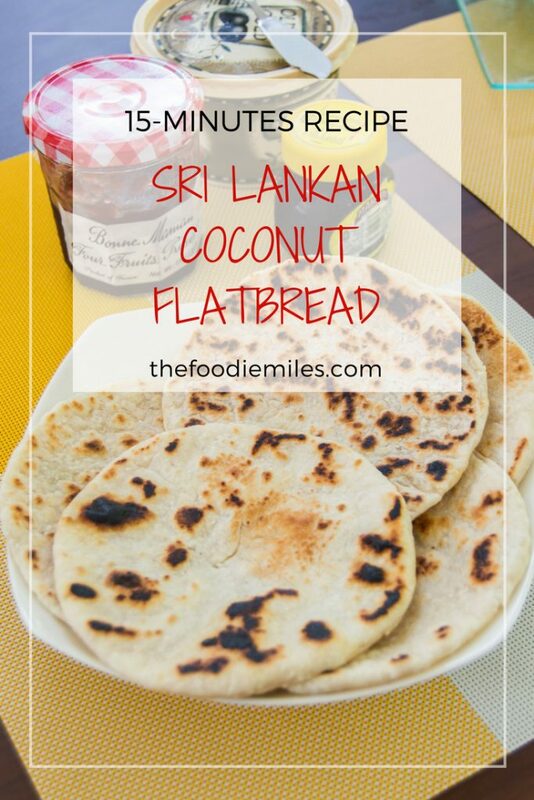 The reason I was so determined to get frozen coconut is because I planned to cook pol roti – Sri Lankan coconut flatbread. In Sri Lanka, nobody goes around hunting for frozen coconut because you have abundance of fresh coconuts in supermarkets or, in some cases, in your own backyard. One does have to break it and scrape it out with his own hands, though. Once scraped, the coconut flesh is mixed with flour, salt, and water until dough forms. Balls of dough are flattened by hand and fried on a pan. Sri Lankans love to have their roti with lunu miris – spicy onion and chili paste. 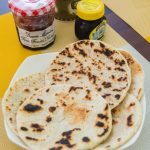 Pol roti served for breakfast with butter, jam and marmite. Like Sri Lankans, I like my roti hot off the pan with a kick of spices from curries. Pol roti with lentil curry and pol sambol (scraped coconut mixed with chili powder and lime juice) is my dream breakfast and usually the first thing I eat upon arrival to the island. Unlike Sri Lankans, I sometimes eat my roti sweet with honey or kithul treacle poured over it. 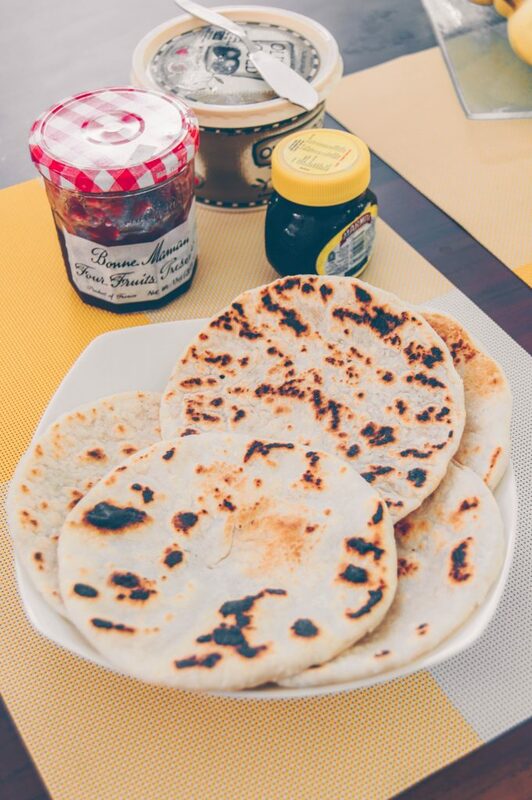 Whether you like it sweet or savory, pol roti deserves to become a staple in your kitchen. 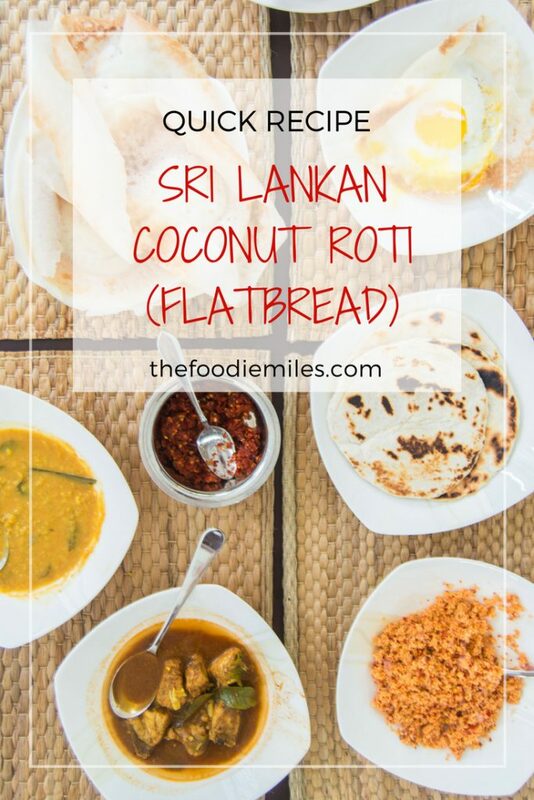 First, Sri Lankan roti is the easiest bread to make. No yeast, no proofing, no resting, in other words: no way to screw it up. Third, apart from breakfast pol roti can be served at dinner with curries or eaten as a snack when the fridge is completely empty and you suddenly remember there’s a whole bunch in the freezer because during the last cooking session you accidentally used 6 cups of flour instead of 2 (true story). 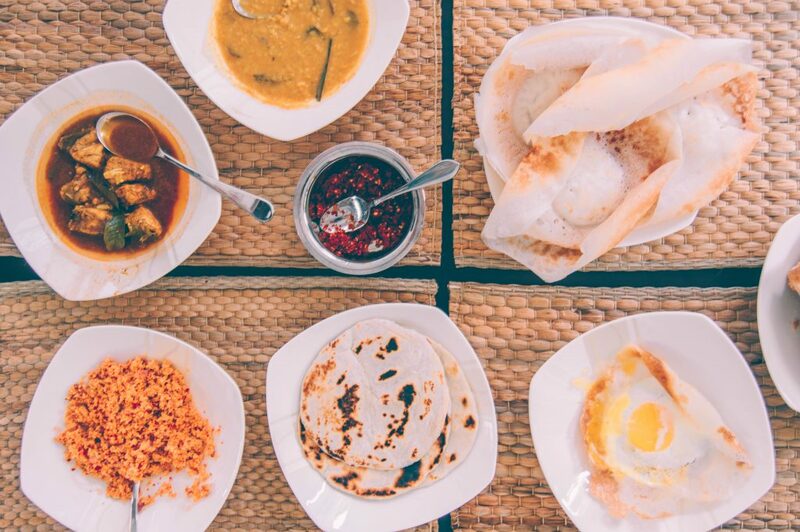 Now off you go to the kitchen and in 15 minutes you can have a Sri Lankan breakfast of your own! If you are using frozen coconut, keep it in the fridge for a couple of hours or overnight to thaw. Sift flour into a bowl. Add grated coconut, salt and mix together. Add water gradually and mix either with your hands or with an electric mixer (using kneading attachments) for a few minutes until all ingredients are combined. Place the dough on the table dusted with flour and keep kneading with your hands for another 3-4 minutes. Take a little bit of dough at a time, roll it into a ball, then flatten the ball into a round 4-5 inches in diameter (10-12 cm). Heat up a pan over medium heat and grease it with butter. Place a roti on the hot pan and grill for 1-2 minutes or until you see that it has golden brown spots on the bottom. Flip it and grill on the other side for another 1 minute. Place the remaining uncooked roti between parchment paper and keep them in the freezer for up to 3-4 weeks. You can find frozen coconut in Indian grocery stores. Some supermarket chains have them too. It’s not desiccated coconut, but fresh grated coconut flesh, frozen. You can use wheat flour or rice flour instead of white flour. Add chopped up onion and chili to the dough if you want your roti to be spicy. I am impressed that your hysteria got such great results. Lol. I actually guffawed my sip of coffee when I read it. Once when I was very pregnant and very hungry I banged on the door of my favorite bagel shop after hours like a complete jerk because I wasn’t thinking straight. They literally opened the door and threw a bag of bagels at the crazy pregnant lady. Your roti looks perfection. Hahahaha! Your story is brilliant, I laughed so much 😀 I think pregnant ladies should be officially allowed to behave irrationally when it comes to food! And thank you for the compliment to my roti!